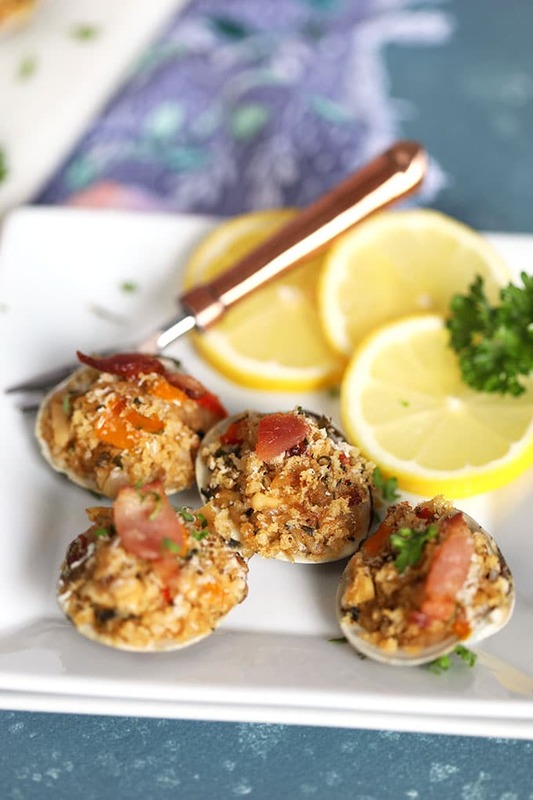 Our favorite party starter, the very BEST Baked Clams Casino are packed with zesty, butter flavor and are so simple to make. 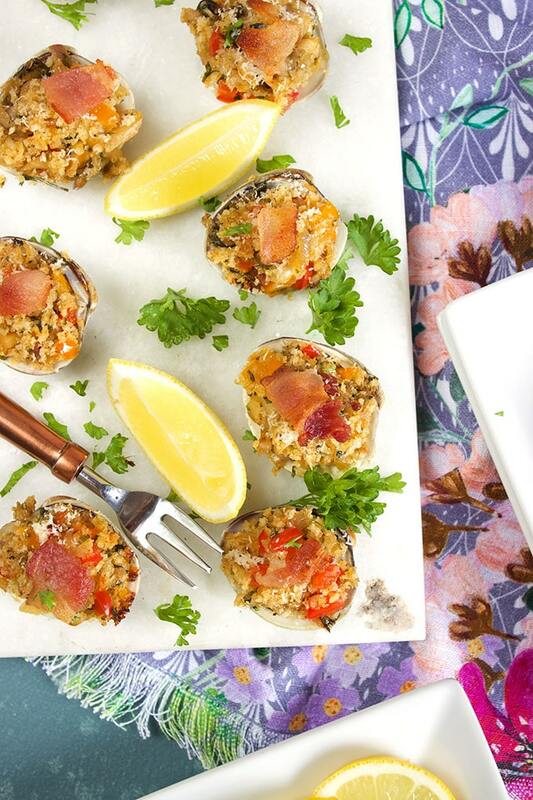 Chopped clams are tossed with a buttery stuffing and topped with a sliver of bacon before being baked to perfection. When summer rolls around, I like to fill my days with as much sand, surf and seafood as I can. I know it’s very possible to enjoy seafood all year long but ever since I was little I felt it was a true necessity to eat all the clams, crabs and lobster I possibly could every time we were at the shore. I still have that urge….to round out every meal with a pile of shellfish and a big bowl of butter for dipping but one of my favorite things to eat ever all year long is Clams Casino. 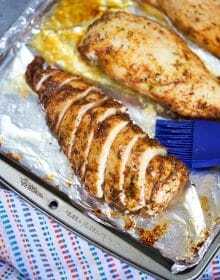 And trust me, I’ve had my fill of bad clams casino so it was important that I made the BEST Clams Casino recipe you would ever sink your teeth into. 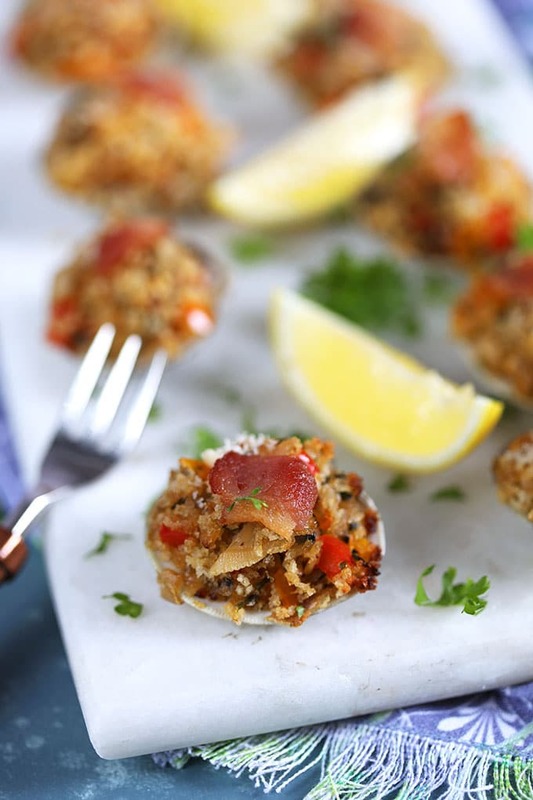 Clams Casino are a “clams on the half shell” appetizer made of chopped clams, bread crumbs and bacon. 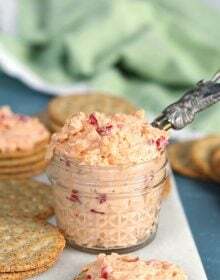 Originating in Rhode Island, this New England style appetizer is popular all over the United States in various forms. 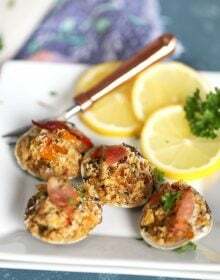 Many versions of Clams Casino are simply a stuffed clam with the same buttery stuffing baked on top but my version is even better because I tossed chopped clams in the stuffing so you don’t have that one chewy piece that sometimes can just be a bit too chewy. Like a big ball of never ending chewing gum. This recipe for Clams Casino couldn’t be simpler to make. First, I rendered some bacon in a pan then removed before it became totally crispy. While the bacon is cooking, wash the clams and arrange on a baking sheet. Roast the clams in the oven until they all open discarding any unopened clams. Remove from the shells and chop roughly. Set aside. Next, I sautéed some veggies (onions, garlic, bell pepper) in the bacon fat until softened. Then, I tossed it all with panko bread crumbs, Italian seasoning, lemon zest and the chopped clams. Stuff the clam shell halves with the stuffing and top with a piece of bacon before baking until crispy and golden brown. This is SERIOUSLY the easiest and BEST Baked Clams Casino recipe around. 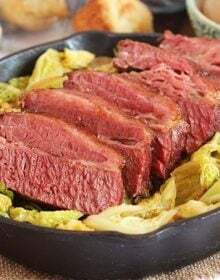 You can even prep ahead and bake them right before serving. 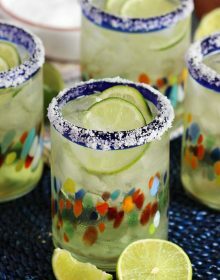 They’re perfect for parties or lazy summer days hanging by the pool. I love to round out a seafood party spread with this Cheesy Baked Crab Dip, my absolute favorite Grilled Seafood Paella (it’s so totally amazing), this refreshing Mango Crab and Avocado Salad and a big pile of Maryland Crab Cakes! 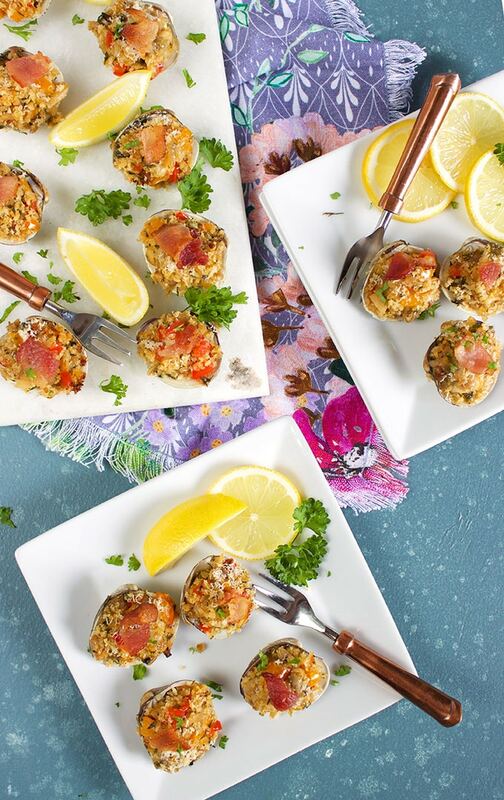 You can also find these Baked Clams Casino at every holiday party alongside this Garlic Roasted Shrimp Cocktail with homemade Cocktail Sauce and a few of my FAVE Lobster Arrancini. 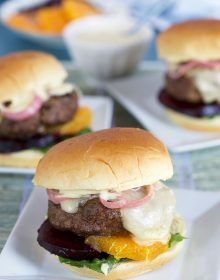 Everyone goes crazy for all three of these simple to make recipes. 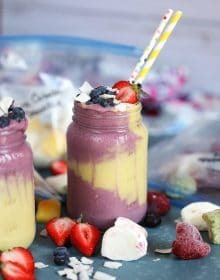 To see what else I’m making for my summer parties be sure to follow along on Instagram! 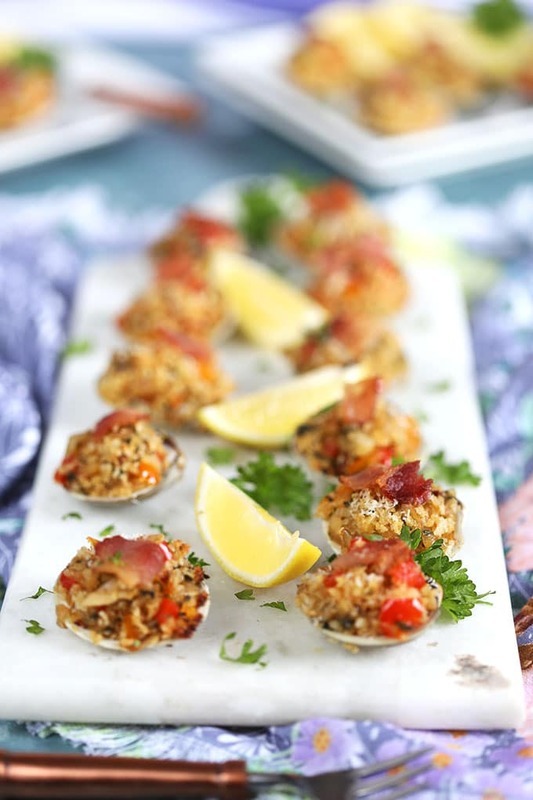 The best party starter, Baked Clams Casino are super easy to make and can be prepped in advance for stress free entertaining! Preheat oven to 350 degrees. Wash the clams and rinse to remove any sand. 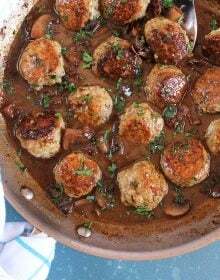 Arrange the clams on a baking sheet and roast in the oven until opened, approximately 4-5 minutes. Discard any unopened clams. Remove the clams from the shells. Roughly chop the clams and set aside. In a large skillet over medium heat, cook the bacon until almost crisp. 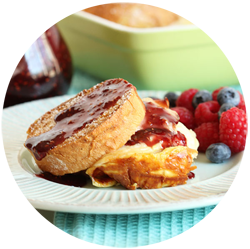 Remove the bacon from the skillet with a slotted spoon and set aside. Add the onion and bell pepper to the pan. 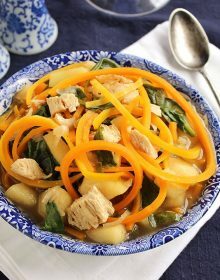 Cook until softened, approximately 3 minutes. Stir in the garlic and cook for an additional minute. Sprinkle with the Italian seasoning. Turn off the heat. Add the bread crumbs, cheese, lemon zest, parsley and clams to the pan tossing to combine thoroughly. Season with salt and pepper, to taste. 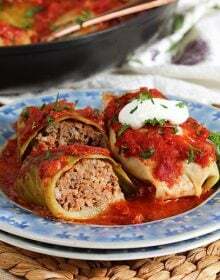 Fill the clam shell halves with a tablespoon of stuffing and arrange on a baking sheet stuffing side up. Top each clam shell with a piece of bacon. Drizzle with olive oil. Bake the clams casino at 450 degrees for 5 minutes or until golden brown and crispy. Sprinkle with additional parmesan cheese and chopped parsley, if desired prior to serving. 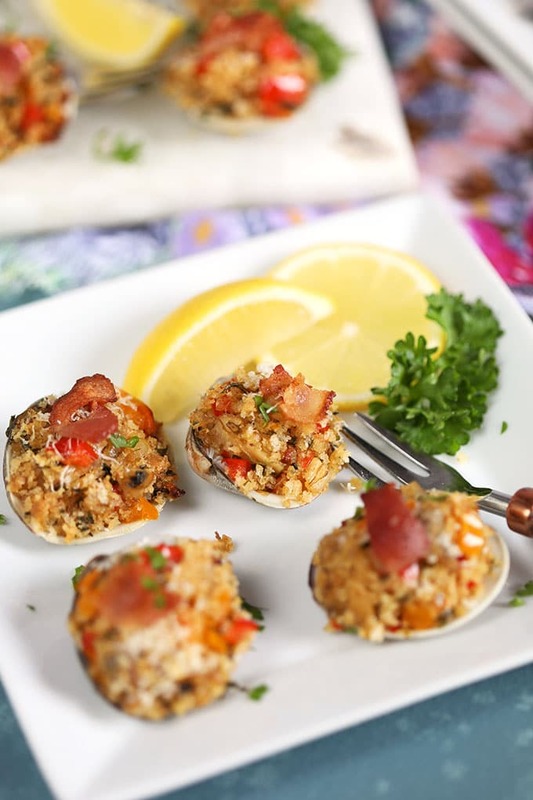 Baked Clams Casino can be assembled up to 24 hours in advance and stored in the refrigerator in an airtight container. Bake just before serving for best results.